Proposition 13 Promised to Keep Our Neighborhoods Stable. Did It Work? 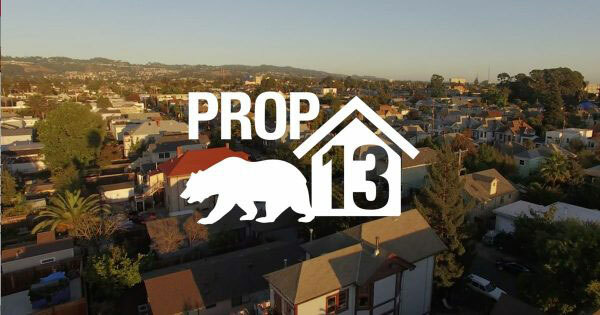 It was an essential promise of Proposition 13: People would be able to keep their homes, neighborhoods would be stable. That promise played a role in the U.S. Supreme Court upholding Proposition 13 when it was challenged. Proposition 13, however, has not stopped gentrification and displacement in neighborhoods across the state. It turns out that as prices soar, the tax benefits of Proposition 13 aren’t enough to stop owners from selling or renting their properties. As for stable property taxes: They offer no direct help to renters. Which is not to say that there aren’t significant benefits for longtime homeowners. 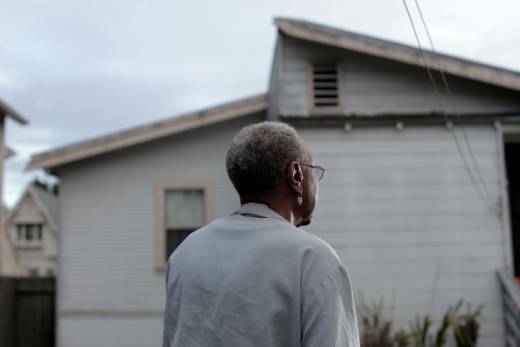 Limited property tax increases have helped keep people like Dorothy in her three-bedroom, one-bath home in North Oakland. Dorothy, whose last name is withheld to protect her privacy, says she bought her modest home back in 1956 for $10,000. Today it’s worth more than $500,000. According to county records, she pays less than $1,300 a year in property taxes. Someone buying that same home today would pay more than $5,000. Dorothy says she’d struggle to pay more. So she’s appreciative of the low taxes. Dorothy talks to us through her metal screen door; she says she wasn’t dressed for company. Another neighbor walks over. “I’m just checking on you,” he calls up. Dorothy says her son is encouraging her to move someplace closer to him, someplace with cheaper housing. She’s not ready to go. Her neighbor, Donna, has lived on this block since 1989. She’s in her early 90s and equally rooted. But the Dorothys and Donnas may well be the exception — the outliers a generation after Proposition 13 fundamentally changed California. What is the connection between Proposition 13 and gentrification? Darrell H. Brown has rented on this block since the mid-'80s. 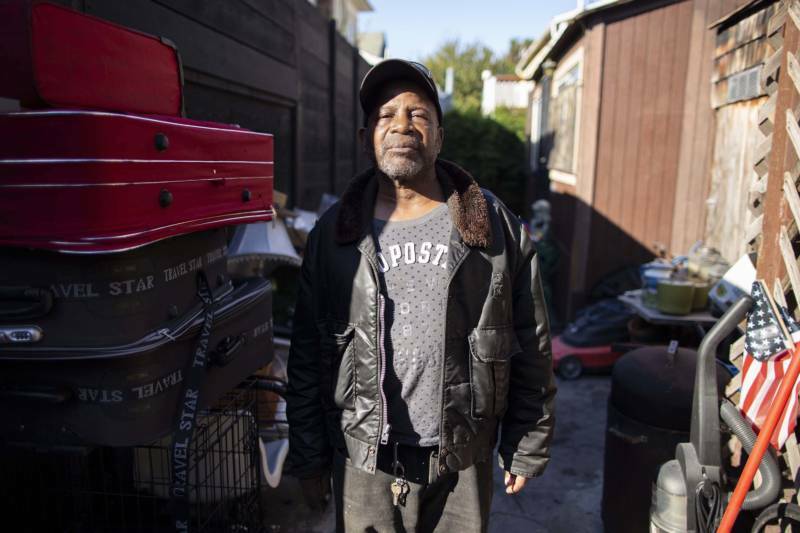 But his landlord has asked him to leave, and he can’t afford another place in the neighborhood. At some level, it comes down to renters vs. owners. Here’s what we do know: Neighborhoods in California’s in-demand coastal cities are changing quickly. Researchers found the number of gentrified neighborhoods in Los Angeles County jumped 16 percent between 1990 and 2015. San Diego County saw an 18 percent increase in gentrified neighborhoods in the same time period. 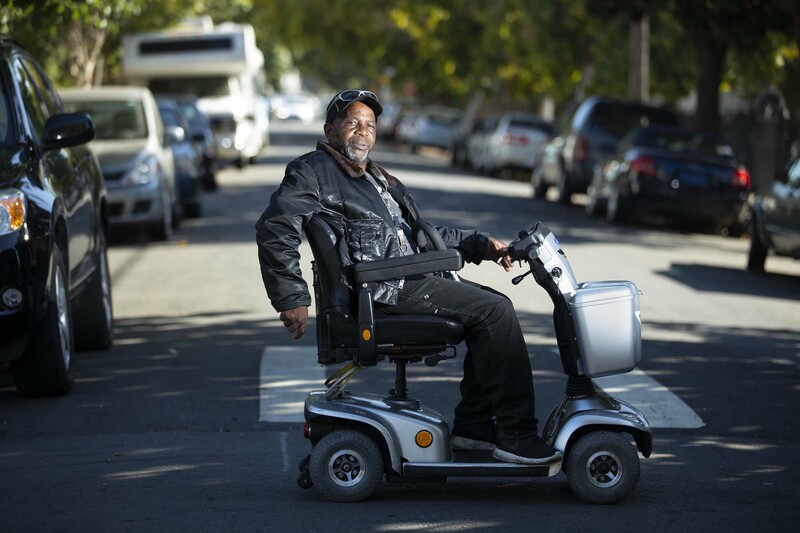 As the demand for housing in the Bay Area grows, Oakland neighborhoods like this are losing low-income residents, according to research from the Urban Displacement Project at UC Berkeley. On this block where we’ve based this reporting project, Dorothy and Donna are among the few remaining longtime residents. According to data from the 2016 American Community Survey, about 10 percent of residents moved into the area before or during the 1980s. Only 4 percent of the residents in this neighborhood lived here before 1970. Back in 1970, homes in this neighborhood sold for about $13,800, according to the U.S. Census Bureau. Even when you account for inflation, there is a massive gulf between then and now. The cost of a home then, adjusted for inflation, would be about $92,000 today. Median rent in the neighborhood was $86 a month in the 1970s, about $574 in today’s dollars. Today, homes on this block can sell for more than $1 million. A two-bed, two-bath apartment on the block rents for $3,000 a month. And as the prices have changed, the demographics of the neighborhood have changed. Back in 1970, about 85 percent of the residents were black, according to U.S. Census data. As of 2016, about 40 percent of the population was white, 33 percent black, about 10 percent Hispanic and 8 percent Asian. In 1970, about 4 percent of adults had four years of college education or more. Now, more than four in 10 residents have earned at least a bachelor’s degree. As real estate in the Bay Area has passed the boiling point, this once-modest neighborhood has also started attracting wealthier residents. According to 2016 census data, median household income was nearly $56,000 a year. Nearly a third of households made more than $100,000. He hates that he has to leave. His experience reflects the pain of gentrification. “When a neighborhood gentrifies, longtime residents may start to move out, and that can really be disruptive for the feeling of community and for long-term relationships,” says Martin, the UC San Diego professor. Still, what gentrification means for homeowners and renters is profoundly different. Homeowners often get to sell at a profit, says Martin. Renters are more often evicted or pushed out.